Emily Weber and Jack Donovan of New York City get in some practice at The Westport Library's 20th Annual Crossword Puzzle Contest at Saugatuck Congregational Church, Saturday, Feb. 2, 2019, in Westport, Conn.
WESTPORT — It was 20 across — the years when The Westport Library hosted its 20th annual Crossword Puzzle Contest at Saugatuck Congregational Church on Saturday afternoon. 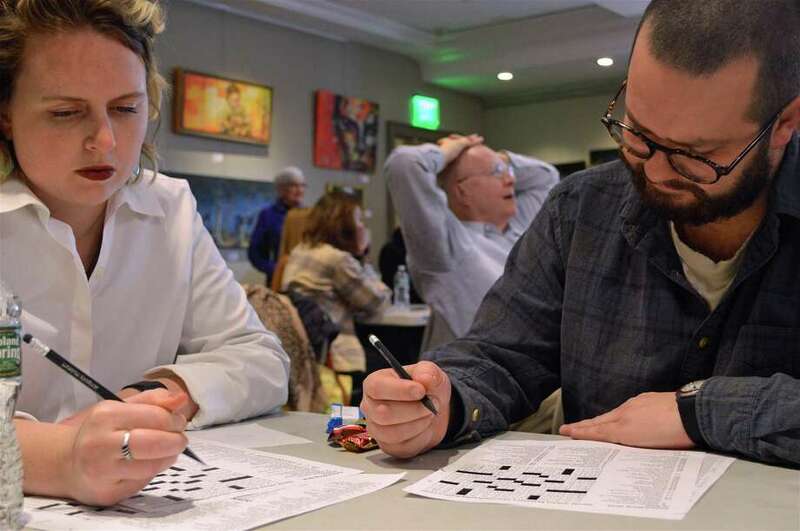 Nearly 100 people came for fun competition, community and, of course, the chance to visit with the veritable guru of the word puzzle — Will Shortz, crossword puzzle editor for The New York Times. “There are lots of crossword puzzle contests around the country that I contribute New York Times crossword puzzles ... but this is the only one that I attend in person,” he said, excepting his own Stamford-based contest. Ken Stern, of Brooklyn, N.Y., was named this year’s crossword puzzle champion, with Jesse Lansner of Rochester, N.Y., and Glen Ryan of Norwich as runners up.